Choose Health Yates is a collaborative effort within Yates County to promote healthy living. The mission of the Choose Health Yates Coaliton is to, “Create a model community that engages community members and organizations in healthy eating and active living through support, advocacy, and education”. The S2AY Rural Health Network facilitates the coalition members: Finger Lakes Health, Dundee Central School District, Penn Yan Central School District, Arc of Yates, YCRR-Yates Cultural and Recreational Resources, Inc. The Community Center, ProAction Yates Office for the Aging, Yates County Public Health, Cornell Cooperative Extension of Yates County, and Our Town RoCKS Dundee Health Improvement Project. The coalition works toward the common goal of creating environments that support healthy eating, active living and healthy weights. Various initiatives of the coalition include the development of a restaurant toolkit, worksite wellness toolkit, Annual Walk-Off Challenge, and participation in the Annual Sidewalk Sale in Penn Yan. For further information on the coalition, please contact Yates County Public Health at (315) 536-5160 . Use these handy resources below to help your child reduce the amount of time they spend in front of a screen! 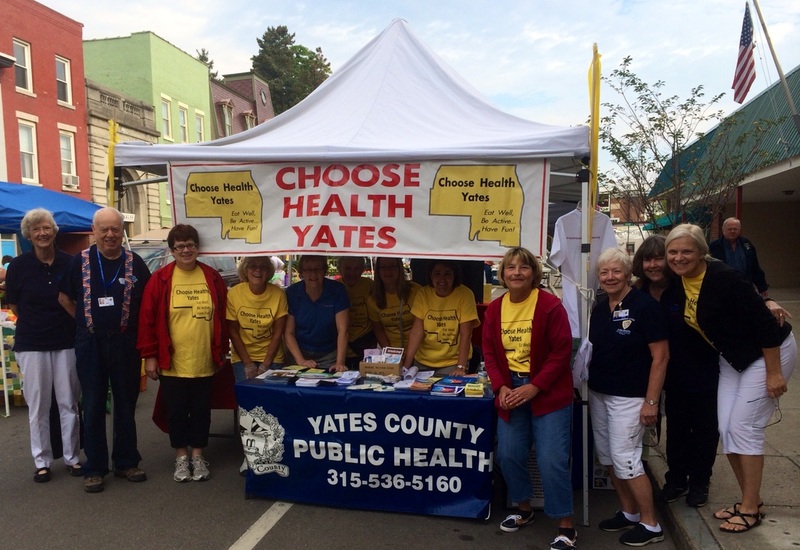 Choose Health Yates reached over 50 community members at this year's Annual Sidewalk Sale! The coalition sponsored a tent with various tables with the joint theme of healthy eating and active living. The coalition also passed out cards for a drawing for two 6-month memberships to the YCRR Fitness and Wellness Center! Read the press release - here! Coalition member, Pam Griffith - Executive Director of the YCRR Fitness and Wellness Center and Tim Gray - owner of Timmy G's restaurant in Penn Yan pose with the Choose Health Yates Restaurant Toolkit! Timmy G's has been very receptive to our efforts around healthy eating and will be highlighting healthier options on their menus! Keep an eye out for similar initiatives in other Yates County restaurants. Lauren Snyder and Karen Hadley from Our Town RoCKS Dundee Health Improvement Project handed out watermelon at the 2013 Annual Sidewalk Sale in Penn Yan! Barb McGuffie of Cornell Cooperative Extension of Yates County played a fun healthy eating game with those visiting the 2013 Annual Sidewalk Sale in Penn Yan!